Skincare ingredients… they can completely transform your skin and help you to achieve your skin goals, whether it be to tame acne, reduce redness or keep your cells as youthful as possible. Our dermaviduals Ambassador, Robyn McAlpine, gives us the low-down on her naughty list of skincare ingredients to avoid. I love being able to work with skincare to create healthy skin for my clients. But one thing that can make or break your results or impact your skin are the ingredients they don’t tell you about. Not all skincare is skin care. Not all ingredients in a product are going to support your skin, so understanding the ingredients list on your cleanser, toner and moisturiser will really help you to make better skin decisions to future proof your skin! A skincare ingredients label will contain upwards of 15-40+ ingredients and knowing what they are and how they impact your skin’s health is vital. Firstly, each ingredient is listed from ‘most to least’, so the ingredients that have the highest content will be at the top, most commonly you will read this as water/aqua. Then towards the bottom will be the ingredients with the least concentration. Yes, they smell sooooo pretty and yes, I know that’s what swayed you to buy it… but these guys are more sinister to the skin than you might realise. Fragrance in skincare is the most irritating/allergy stimulating ingredient in most skincare formulations. To mask the unpleasant odours of the raw ingredients. It’s worth noting that some raw cosmetic ingredients are “stinkier” than others and require masking with a fragrance. So a product made with low-grade raw materials will generally require more fragrance to mask them. To enhance the cosmetic appeal/saleability. You know you’ve done it, flipped open the tube to smell what’s inside, passing it around for everyone to enjoy! You buy with all your senses and manufacturers know that smell is a very powerful one! Prestige or distinction: many brands have a signature scent or they even use fragrance to lead you to believe that certain smells represent certain uses i.e. peppermint or tea tree for acne. 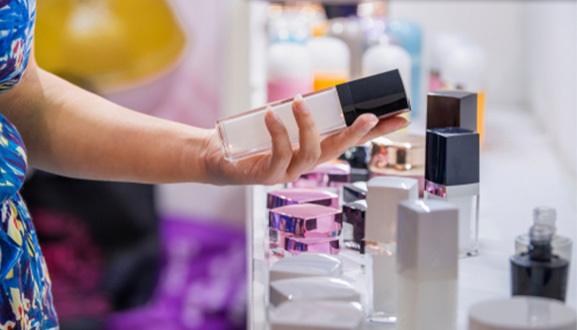 Fragrances are often the leading cause of allergy and sun sensitivity (hello, pigmentation!) and are the number one thing on my list to avoid at all costs! Yes, even the “natural ones”. Our skin is a living breathing organ, just like your heart or your lungs. You wouldn’t go spraying perfume on your liver or kidneys, they simply do not need it to function. Same goes for our skin! This less than desirable preservative is often used in the place of parabens (also so a product can claim a “paraben free” or “natural” status). This ingredient is a known carcinogen and is formaldehyde-releasing in its function. It is also used as a penetration enhancer. It does this by breaking down your skin’s protective barrier, delivering a cocktail of toxic ingredients into your body. These days there are much more intelligent and less toxic ways to deliver safe active ingredients into the skin. Studies on animals have shown this ingredient to be a skin irritant, even at low doses. Considering that this is a commonly used ingredient, you could be applying it several times per day with multiple product layering. A pesky preservative that is cytotoxic (yep.. that means its toxic to cells). The concern lies in the of sensitisation and allergic reactions caused (as well as cell and nerve damage). Used to stop germs in water-based solutions, this nasty compound is also used in industrial applications. When it’s applied to broken skin (think of pimples you’ve picked, freshly waxed eyebrows, or pash rash) it’s getting a free entry into your body! Now the powers that be have limited its use, saying that it is safe to use in small doses (the tests were done on rats in a lab) but if you look closely at the products you apply to your body (cleanser, toner, exfoliant, moisturiser, deodorant, body lotion, makeup wipes, sunscreen, shampoo, conditioner, shaving creams, body washes and everything else you put on over the course of a day), you could be exceeding the minimum safe dose. Oh… and aside from all of this, methylisothiazolinone a big culprit in the development of contact dermatitis. This less than savoury, yet commonly used ingredient, is a petroleum by-product that coats the skin like plastic, clogging pores, promoting acne and disrupting the communication from the keratinocyte to the cells below. This disruption slows down skin function and cell development, unwittingly causing premature ageing (eek!). Mineral oil interferes with your skin’s ability to eliminate toxins. Used in many products promoted as a skin moisturising ingredient, it’s a cheap, mass-produced ingredient used both in the cosmetic and industrial industries (yay). This one… you’ll find it everywhere! This is a surfactant used in washing up detergent, shampoo, hand washes, cleansers, some moisturisers & leave-on skin products, toothpaste, shaving cream, bubble bath, car washes, garage floor cleaners and engine degreasers… it is in 90% of personal-care products that foam. The more foaming, the more surfatants. SLS/SLES is a well-documented skin irritant that poses serious health risks. Animals exposed to it experience eye damage, depression, laboured breathing, diarrhoea, severe skin irritation, and even death (eeeeek!!). SLS affects the skin’s immune system and ability to maintain a protective barrier by causing layers to separate and inflame. You can’t always see this with the naked eye! Oh, and your skin may retain the SLS for several days after exposure. To top it off, SLS is derived from palm oil (sorry orangutans!) It’s on my no-go list!! This bad boy (and I don’t mean he’s a misguided but attractive man that is exciting to date) is an uncouth ingredient that is an antimicrobial formaldehyde-releasing preservative (formaldehyde is a carcinogen). DMDM Hydantoin is a known and documented human immune system toxicant, a human skin toxicant, eye irritant, restricted or banned from use in cosmetics in some countries, sadly not Australia or New Zealand at present. So you need to keep your eyes peeled for this one. It’s quite commonly used in both cheap skincare products all the way up to those in the fancy department stores. This sneaky ingredient was in one of the products I was using in my “skin care experiment”, where I used department store skin care for 6 weeks. A highly caustic and reactive inorganic base, mostly used as a pH balancer to keep all the ingredients happy living together, but considered a strong skin irritant. Also known as caustic soda, sodium hydrate or soda lye, this ingredient can irritate eyes, skin, mucous membranes and even cause temporary loss of hair. No thank you! Used in skincare as an antifungal and preservative, this paraben is a well-known endocrine disruptor, a human skin toxicant that interferes with gene expression. Knowing this you should also know that our skin cells carry our genetic DNA in order to be able to reproduce and create skin for us… so let that just rattle around in your brain for a moment – a gene disruptor being applied to our cells that carry our DNA… eeek!! Parabens have also been linked to breast cancer and have been shown to mimic estrogen in the body. For a commonly used ingredient, its got a pretty bad reputation! This unassuming guy is a plastic polymer that works as a stabiliser or as a viscosity increasing agent (creating the ideal level of thickness to a cream). This ingredient is a human skin toxicant that is not safe to use on damaged or broken skin. Don’t have “broken skin”? You might be thinking about cuts and scrapes, but all it takes is a spot you’ve picked, an impaired barrier created by surfactants and other surface tension causing ingredients to open up our skin. This is classed as “broken” skin and gives this nasty guy a backstage pass to get in and wreak havoc with your skin. A surfactant and emulsifying agent, it is also not safe to use this ingredient on damaged or broken skin. Let’s talk about emulsifiers: they are a binding agent that holds water and oil together. They are very high tech in the role that they play but when applied to the skin, they don’t know when to stop. So they continue to bind the oil and water that sits between our skin cells. When you wash your moisturiser off, it takes with it the emulsifier and everything that it has bound itself to throughout the day. Thus creating gaps between your cells. These gaps then make an entry point for other not-so-skin-friendly ingredients and also impact our keratinocyte lifecycle (our skin’s natural cell lifecycle). Now I bet you’re thinking… they can do that?! Surely if they knew what these ingredients did, skincare ranges wouldn’t use them and sell them to the unsuspecting general public? Well, unfortunately, yes they can and they do. The commercial skin care industry couldn’t be further from skin care. But knowledge is power and when you know what to look for, you can make informed decisions about what goes onto (and into) your body.